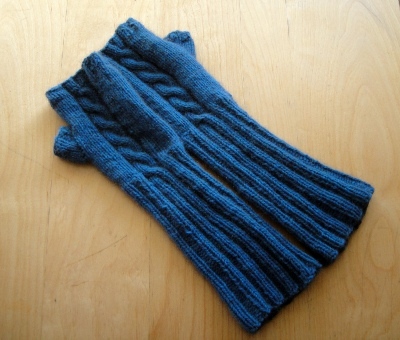 It’s funny how one person’s “like” can be another’s “ugh!” Like the other day, when I was proudly showing my mother a photo of the fingerless gloves I had designed and knitted for a friend. A sniff of disapproval and general muttering about “people who wear outlandish clothing” trails down the corridor. I shrug. They’re not her gig. But they sure are mine!! That’s one of the great joys of knitting. It allows you freedom to express your individuality and creativity at the same time. And today, I saw a girl wearing a t-shirt with the coolest fingerless gloves in a super-light merino, and they reached past her elbows… Suddenly, my forearm-length gloves didn’t seem long enough. I’m just going to have to knit another pair now. Categories: Knitting, Merino, Possum, yarn | Tags: craft, creativity, fashion, Knitting, New Zealand, opinion, Possum | Permalink.